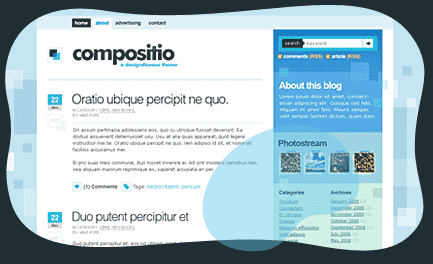 Compositio is new 2 column theme form designdisease. It has cool combo of white and blue colors. Theme looks classy with focus on post title and content. Left sidebar has more color with multiple columns and tabbed content box. While Design Disease has released this free for WordPress blogs, Zona Cerebral has ported this theme beautifully for Blogger blogs. So, if you have either wordpress or blogger blog – you can download and use it on your blogs. Grab this beautiful theme: [Wordpress Version: Demo – Download] [Blogger Version: Demo – Download]. I really like it, but I found the post date time stamp can’t appear for every posts except the top one in blogger.